A Facebook friend posted this picture earlier today. 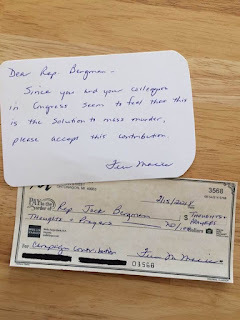 It's a "campaign contribution" from a frustrated constituent to a member of Congress whose only response to yet another school shooting in the United States is "thoughts and prayers." 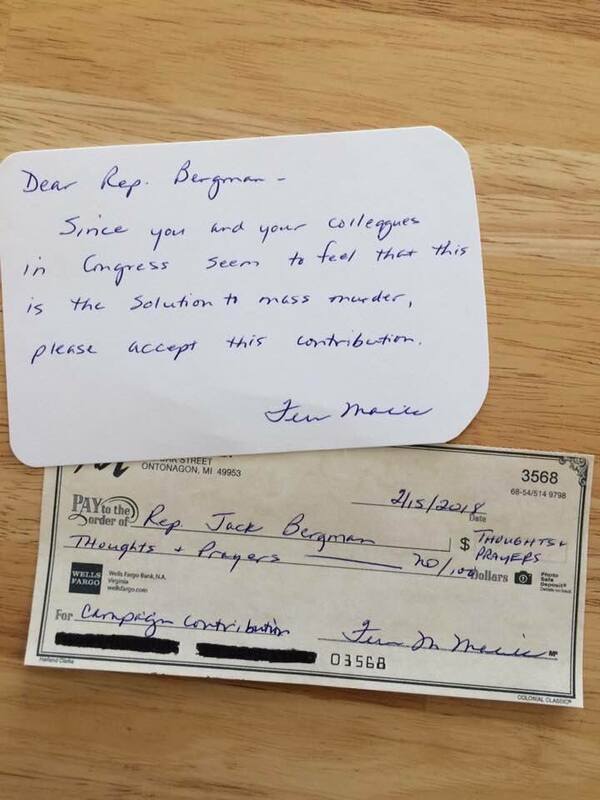 I too grow frustrated with the seeming unwillingness of Congress to act on a host of important matters. Inertia born of a corrupted congressional apportionment process, the influence of interest group money, and spinelessness of legislators fearful they won't be re-elected is an ongoing reality in America. And it's true that public figures send out hollow assurances of "thoughts and prayers" after mass shootings, terrorist acts, and other tragedies. But I confess to wincing every time I read or hear someone say, "Prayer doesn't solve anything. It's time for action." Actually, a slew of research done at top universities, including Harvard, shows that prayer, in fact, can solve lots of things. Two books I recommend to skeptics, both written by medical doctors and incorporating findings from rigorous scientific studies, are Healing Words: The Power of Prayer and the Practice of Medicine by Larry Dossey and The Faith Factor: Proof of the Healing Power of Prayer by Dale Matthews and Connie Clark. These books affirm what has been my experience after forty-two years as a Christian and thirty-three years as a pastor: Prayer can make a difference, both in the lives of those for whom prayer is offered and, importantly, in the lives of those who pray. But prayer only makes a difference if those who pray do so with an openness to acting on what they pray about, an openness to God inciting them to action. As a Christian, I'm taught to pray in Jesus' name. For example, Jesus says in John 16:24: "Until now you have not asked for anything in my name. Ask and you will receive, and your joy will be complete." Intrinsic to this second element of prayer is the willingness to be called by God to have our own agendas changed, to be called by God to act. True prayer is surrender. It's something you actually do and something God may use to tell you what to do. But that happens only if you're really praying. Only if your prayer is an actual conversation with God in which you take the time to listen to what God tells you in His Word, the Bible, and in your spirit as you listen for His still small voice as you pray. 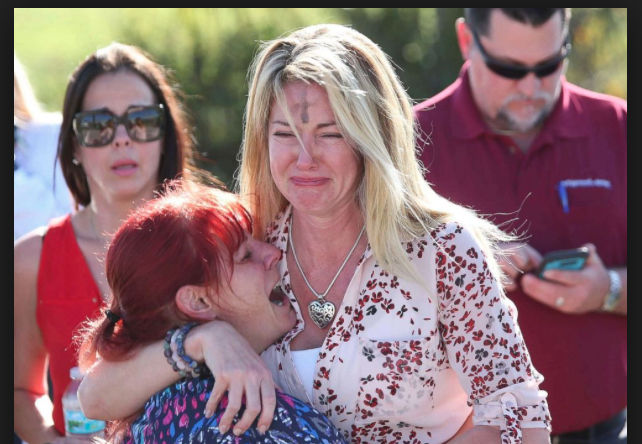 In fact, it's difficult not to suspect that all the sweet-sounding assurances of "thoughts and prayers" are nothing more than idle words, like saying, "I'll be there in spirit." As Pastor Rick Warren points out, people who say that they'll be somewhere in spirit are really saying, "I won't be there," no matter how high-minded they may want to sound. The apostle Paul and his ministry team were dialed into God through their reading of God's Word in the Old Testament (the New Testament didn't yet exist), their relationship with God through the risen Jesus, and their times in prayer in Jesus' name. These verses tell us that at first, they felt prevented from taking the good news of new life for all who repent and believe in Jesus into Asia (by which the New Testament writers meant Asia Minor, which is now largely composed of Turkey). They were prevented not by soldiers, but by God. It wasn't time for them to go into Asia yet. How did they know not to act? Because God impressed that view on them as they read God's Word and prayed. Once again, the "Spirit of Jesus" prevented them going into Bithynia. But that night, in a dream, God seemed to tell Paul that he and his team were to go to Macedonia. When Paul shared his vision with the others, they all appear to agree that this was what God wanted them to do. In other words, when Paul and the others prayerfully lived in community with God through Christ, they were given their marching orders. Action was born in humble prayer. Prayer is not the opposite of action. Prayer is useful action's motive force. When we act without a vibrant prayer relationship with God through Christ, our action is futile. When we fail to act after we've prayed and God has impressed us with the action we need to take, the fault is not with God or prayer, but with us. So, of course, we should be praying for the victims of gun violence. But we should also pray asking God what it is He would have us to do in the face of this scourge on our country. And then, for the sake of Christ and all for whom He died and rose, we should act.